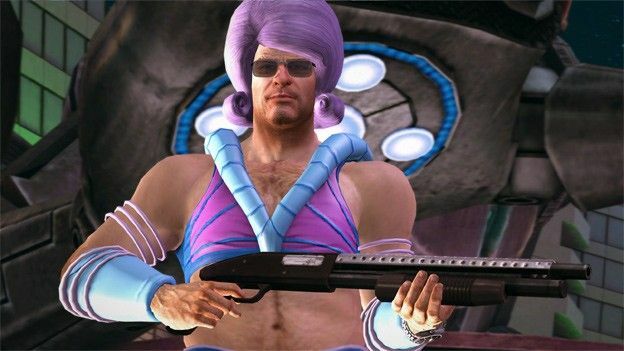 Frank has returned in the form of Dead Rising 2: Off The Record and with it he brings the same utterly ridiculous levels of chaos, inappropriate humour and of course gore, question is, will that be enough? To begin with, this is not a serious game. In fact, if you were to imagine a bar full of games, Battlefield 3 and Call of Duty: Modern Warfare 3 would be sat hunched over in a corner whispering quietly while Dead Rising 2 would be that guy downing shots of tequila making inappropriate remarks about the staff's 'people skills'. With this in mind do not expect a storyline that will have you on the edge of your seat, don't by any means expect a soundtrack that will have you being urged on to succeed and last but not least, don't expect graphics that will have you hiding behind a sofa looking for the nearest electric guitar. Once you accept these facts (not shortcomings) you can focus on the reasons why you won't put it down and put quite simply, it's because it's fun. In case you're not aware of the original, you play Frank West, a photojournalist who always seems to be in the wrong place at the right time, by which we mean, caught in the middle of a zombie apocalypse. The storyline is simple, after the ending of the first title you've got rich, blown all your money and generally gone a bit 'Hunter S Thompson' on yourself, after having resorted to fighting zombies for money in a reality show you finally decide to get back in the game. Luckily for you, this also coincides with a massive zombie outbreak at the television studios flooding out into the city. With the return of Frank comes the return of his camera, and in many ways, the return of this game's saving grace. While endlessly bashing zombies is indeed good fun, sometimes the word 'tedious' can spring to mind, with the photography back however the incentive returns to produce the most outrageous kills and capture the most ridiculous moments. Luckily Fortune City is just the place, looking like a modern day Vice City the place is a hotbed for gambling and debauchery, leading to some truly comical zombie incarnations. This leads on to the humour, which thankfully is as garish and un-PC as ever with Frank, happy to be reunited with his old pals, enjoying every single moment of it. Co-op is present and correct, appearing in the form of a call to Frank's bluetooth headset where it can be either accepted or rejected. Vehicles have also made the return as has the truly staggering range of items you can use to dispatch the undead with. It's utterly silly, the graphics aren't amazing and eventually, you will get bored, but when you think that it's cheaper than Dead Rising 2 and still let's you beat a zombie down with a traffic cone, are you really going to care? Probably not. So in conclusion, if you want something that will leave you open-jawed then there's plenty of blockbuster titles at the moment. If instead you'd rather something that doesn't take itself too seriously and lets you quite literally beat a zombie down with a bowl of petunias, the this is for you.